A Healthy and Delicious Breakfast! We are so fortunate to have access to the freshest and BEST produce here. Our breakfast yesterday consisted of blackberries and blueberries grown on the mainland (near where Ron’s sister, Mary, lives at Ajijic, beside Lake Chapala and half an hour from Guadalajara), fresh organic papaya from our friend, Alberto, who lives and has his organic farm just outside of San José del Cabo, fresh whole walnuts from Ron’s Mom that are grown near Santa Clara, CA, and fresh pomegranate, picked in our garden the day before. 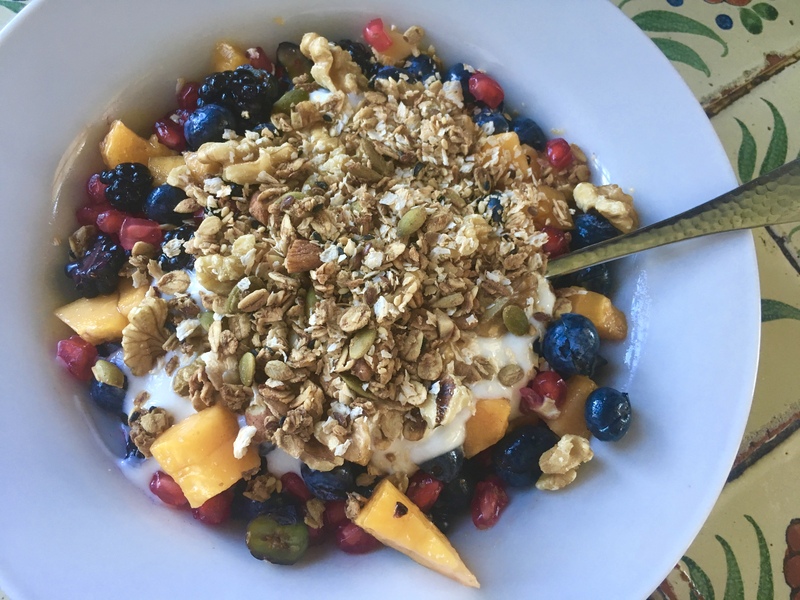 Add some yogurt and some homemade granola – an explosion of flavor and goodness to start the day! Tagged Ajijic, blackberries, blueberries, breakfast, fresh, garden, granola, Guadalajara, Lake Chapala, organic, papaya, pomegranate, produce, San José del Cabo, Santa Clara, walnuts, yogurt.